Three important things happened today. I purchased a domain: http://hning.asia/ . I'm still in the moving process, hopefully by next month you can go immediately to that link and find me. Why .asia, you might ask? Because Hning.com is already taken. Because I'm understatedly proud of my Asian roots, and most of this blog's resources and references come from there. Yeah, Saudi Arabia, Jerusalem, India, Japan, and Indonesia are all in Asia, folks. This blog has been rewarded with acknowledgement and a prize. Jonathan Mead from Illuminated Mind sent me his eBook, Reclaim Your Dreams because I got to reach 1000-visit traffic mark this month, for the first time ever! I'll review the book as soon as I'm done reading it. Promise. The Timekeeper told me that I'm genetically and genealogically doomed, since I descended from a strong line of witches and tyrants. Crap! Trying to balance between the two uppity feelings and the serious downer from the Timekeeper at the end of the day kinda took a toll on my linguistic fluency; I'm spent. But I just had to come here to give you those updates and tell you how very, very thankful I am to have your presence and support here all this time, throughout my ramblings, swings and vicious remarks. This blog wouldn't have meant much without you coming here, and I wish I could say it to every single time that you visit. 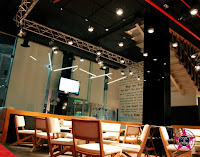 Adil, my other brother, took so much of his sweet time in getting that café of his finished. Gentole once commented here that middle children are often the ignored ones. The strip answers that claim. That's why! Ha! 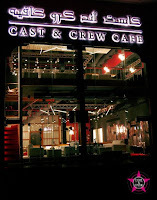 And since I mentioned it, Cast N Crew Café is opening May 1st, 2009, in Najmat al Rawdah, Rawdah St., Jeddah, Saudi Arabia. Check it out; from the look of it, it's worth the wait.